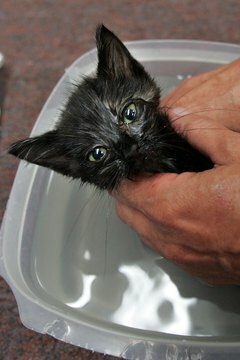 When Can You Give a Kitten a Flea Bath? In a perfect world, a flea-free mother cat would give birth to her kittens in a flea-free environment. In reality, kittens sometimes can suffer heavy flea infestations from the moment they are born. The biting fleas can cause anemia, carry feline tapeworms and can be fatal to kittens. It is important to get rid of fleas on kittens as soon as you become aware they have them. If a kitten has fleas, you should give him a flea bath. It is best to bathe him early in the day while the temperature is rising. Use warm water and test the temperature the same way you would for a baby. Put him in water up to his neck and watch the fleas run up his face. Use Dawn dish-washing liquid and lather over the top of his head while protecting his eyes. After rinsing wrap a clean towel around him and place him somewhere clean and warm. Run a flea comb through the fur of your kitten while he is still wet, concentrating around the base of his tail and ears and where his legs join his belly. Have a cup of very hot water handy, to drop fleas in as you find them. Comb him a couple of times then flush the water with fleas down the toilet and towel dry your boy as well as you can. Do not use a hair dryer as you can easily burn his delicate young skin. If you have a young kitten with fleas, that probably means mom and his brothers and sisters have them too. If one kitten has fleas, they all must be treated. Mom can be treated with a spot-on flea product but the kittens will have to have a bath. While the kittens are getting their bath, their bedding should be being washed in hot water, and the area where they play should be vacuumed thoroughly. Once a kitten reaches 8 weeks old, you can use chemical flea treatments if you wish. However, if you get your kitten used to the occasional bath, there is no reason you cannot continue to bath him when fleas are present. Flea treatments are convenient to use, but they do contain strong chemicals, which may have long-term effects on your pet.